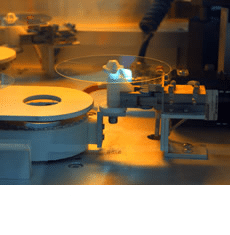 The glass master is polished until it is ultra smooth as even microscopic scratches can affect the quality of the CDs being produced. Glass mastering is performed in a Class 100 clean room (10 times cleaner than an operating theatre). A Class 100 cleanroom is designed to never allow more than 100 particles (0.5 microns or larger) per cubic foot of air (typical office building air contains from 500,000 to 1,000,000 particles per cubic foot of air). This is because dust, pollen and smoke particles can all affect the quality of a CD glass master whilst it is being prepared, so the mastering facilities are kept as clean as possible. The first step in producing the glass master is to clean the glass plate with detergents and to then apply a photoresistive light-sensitive material of about 140 to 150 microns that is then burnt using a Laser Beam Recorder (LBR) which is a deep blue or ultraviolet laser. When exposed to the laser light, the photoresist undergoes a chemical reaction which hardens it. After mastering, the glass master is baked at about 80°C for 30 minutes to harden the developed surface material and prepare it for metalisation. Metalisation is a critical step prior to electroplating with nickel. After the photoresist mastering, the developed glass master is placed in a vapour deposition metaliser which lowers the pressure inside a chamber to an extreme vacuum. A piece of nickel wire is then heated to white hot temperature and the nickel vapour is deposited onto the rotating glass master. The glass master is coated with the nickel vapour up to a typical thickness of around 400nm before being removed. The information contained on the metalised glass master is extremely fragile and it must be transferred to a more resilient form for use in the injection moulding equipment. The metalised master is therefore rotated in a plating tank containing a nickel salt solution (Nickel Sulfamate). The electroforming process takes approximately 1 hour to create a 0.3mm thick uniform nickel layer. This master is then called the ‘father’ and a negative of the father, the ‘mother’ needs to be created to be able to punch the pits and grooves into the membranes on the final CDs or DVDs that the customer will receive. The mother glass master is created from the father using electroforming and the mothers are then used to punch holes in the membrane layer on replicated CDs or DVDs that will then allow light through to reflect off the silver aluminium layer above the membrane layer in the centre of a CD or DVD.